*Corresponding Author: Almamoori Fawwaz, Department of Medical Retina, Sharif Eye Center, Jordan. Objective: To evaluate macular vascular circulation in patient with perifoveal vasculitis secondary to Behcet's disease by using (Retinal Flow) swept source optical coherence tomography angiography map. Methods: We retrospectively review a 39-y old female patient, with history of Behcet's disease, presented with history of sudden unexplained central loss of vision which was more significant on the right eye with best corrected vision (BCVA=0.1) and less on the left eye with best corrected visual acuity (BCVA=0.7). The clinical ophthalmic examination of both anterior and posterior segments for the both eyes were normal with no any signs of uveitis. Imaging with DRI Triton Swept Source (SS- OCTA) (Topcon, Japan) was performed for evaluation of both superficial and deep capillary plexus of macular area. Fluorescein angiography (FA) was used also for assessing foveal avascular zone features. Results: The SS-OCTA Retinal Flow map was more sensitive than FA in marking out hypoperfusion in both superficial capillary plexus (SCP), and deep capillary plexus (DCP), especially in the right eye which had the positive correlation with visual acuity. SS-OCTA Retinal Flow map was also sensitive in showing improvement of macular hypoperfusion after treatment of Behcet's Perifoveal Vasculitis. Conclusion: OCTA is a noninvasive imaging modality that can be used to evaluate macular vascular changes in Bechet’s perifoveal vasculitis and can explain acute visual loss in Behcet. Abbreviations: BCVA=Best Corrected Visual Acuity; SS- OCTA=Swept Source-Optical Coherence Tomography Angiography; FA=Fluorescein Angiography; SCP=Superficial Capillary Plexus; DCP=Deep Capillary Plexus; AZ=Foveal Avascular Zone. Bechet’s disease is relapsing multisystemic nongranulomatous obliterative vasculitis affecting both arteries and veins including vasculopathy of capillaries. It was described in 1937 by Hulusi Bechet as a traid of oral aphthous ulcer, genital ulcer, and uveitis . It can affect multiple organs, such as heart, joints, and central nervous system. Fluorescein angiography (FA) can show better details of the retinal vessels in the acute stage.it can reveal the areas of non-perfusion due to retinal vasculitis. However, it is unable to show superficial and deep capillary vasculature separately in addition to its limitation as a relatively invasive imaging modality in some patients due to dye usage . Optical coherence tomography angiography (OCTA) is a recently developed, noninvasive, dye-less imaging modality, which can detect motion of the blood cells within retinal vessels . It can provide a quantitive estimation of macular circulation by calculating vessel density and mapping out the macular vasculature layer by layer, through showing the superficial capillary plexus, deep capillary plexus and choriocapillaris. OCTA s abnormalities were identified in patients with retinal vasculitis, these include capillary dropout/loss in the superficial and deep capillary plexus, enlargement and/or irregularity of the foveal avascular zone, and capillary remodeling. Often these abnormalities were not visible on fluorescein angiography. This is a retrospective case report study reviewing a case of Behcet's disease, presented with history of sudden unexplained central loss of vision which was more severe in the right eye. Visual acuity on presentation was 0.1 in the right eye and 0.7 in the left eye, with no relative afferent pupillary defect. Examinations of anterior segment and posterior segment of both eyes were normal with no any uveitis activity. Fluorescein angiography (FA) images showed a bilateral perifoveal vascular staining in the late phase with slight enlargement of foveal avascular zone (FAZ) in the right eye that caused by perifoveal vasculitis Figure 1. Figure 1: A, C: Fluorescein angiography of the right and the left eye in the late venous phase. B, D: Magnified FA images that showing a perifoveal vascular staining and leakage with slight enlargement of FAZ in the right eye]. 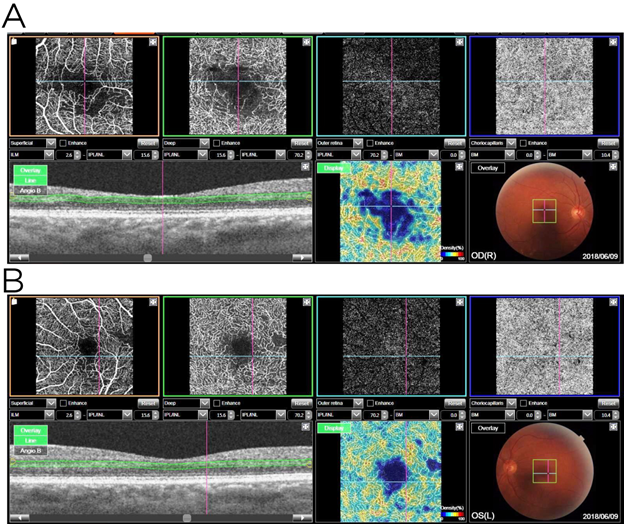 DRI swept source OCT Triton (Topcon Corporation, Tokyo, Japan) was used to evaluate the foveal vascular structure. 3×3 mm OCTA images centered at the macular region were performed by using 100,000 Hz of A-scan. Swept source optical coherence tomography angiography (SS-OCTA) dissected the retina and delivered multiple coronal views at variant depths; showing firstly superficial retinal plexus (SCP), then deep retinal plexus (DCP), then avascular outer retina, and lastly penetrating to show choriocapillaris . Perifoveal hypoperfusion area in OCTA was shown within 3×3 mm image centered at fovea. It was evaluated conjunction with FA images. 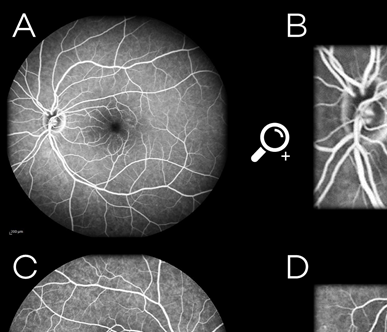 OCTA images with the use of (RETINAL FLOW MAP) were able to identify very clearly the perifoveal hypoperfusion that extends to involve both (SCP) and (DCP). The perifoveal hypoperfusion areas were larger in the SS- OCTA (RETINAL FLOW MAP) images in the right eye rather than in the left eye, which corresponded to severe unexplained visual loss in the right eye Figure 2. Figure 2A,B: The SS-OCTA in conjunction with (RETINAL FLOW MAP) images 3×3 mm, that showing ischemia on both SCP and DCP, the ischemia was more remarkable in DCP than in SCP and more severe in right eye than in the left]. Since the retinal vasculitis is considered as a sight threatening complication, we decided to treat the patient with pulse s therapy of (1gm Methylprednisolone IV/day) for 3 days followed by oral prednisolone and azathioprine. After 2 weeks of treatment, the patient reported a significant improvement in vision in both eyes. The BCVA improved from 0.1 to 0.7 in the right eye, and from 0.7 to 1.0 in the left eye. The SS-OCTA in conjunction with (RETINAL FLOW MAP) images were showed a dramatic regression in perifoveal ischemic areas in both eyes with macular reperfusion Figure 3. Retinal vasculitis is one of the consequences of many systemic inflammatory disorders like Bechet disease, sarcoidosis, SLE, TB---etc. Retinal vasculitis is best diagnosed with fluorescein angiography (FA). FA can identify the inflammatory vascular changes associated with vasculitis like occlusion or leakage, however, FA has the limitation to detect DCP and could underestimate macular hypoperfusion due to perifoveal vasculitis. Imaging with OCTA allows us to measure FAZ and hypoperfusion in both eyes without obscurations caused by fluorescein dye in addition to evaluation of (SCP and DCP). SS-OCTA Retinal flow map generates a color-coded map of relative blood flow in the macular area and can efficiently marking out ischemia in SCP & DCP. In our case report, DCP ischemia was significantly larger than SCP that consistent with other studies (Khairallah., et al.) . DCP ischemia were reported in the other retinal diseases like diabetic retinopathy and retinal vein occlusion . After 2 weeks of treatment of our case with pulse and immunosuppressive therapy, a macular reperfusion was observed on SS-OCTA images in both SCP & DCP with improvement of vision in both eyes. Swept source optical coherence tomography angiography (SS-OCTA) including Retinal Density Map modality, have leaded the way to diagnose, assess and follow up ischemia in Bechet’s perifoveal vasculitis, and gave the clue to sudden severe unexplained visual loss in such cases. Behcet H (1937) Dermatol Wochenschr 105:1152-1157. Atmaca LS. (1989). Fundus changes associated with Bechet’s disease. Grafes Arch Clin Exp Ophthalmol 227: 340-344.
tomography angiography. Invest Ophthalmol Vis Sci. 57(9): 27–36. Khairallah M, Abrough N., Khochtali S., (2016). Optical coherence tomography in patient with behcet uveitis. Retin. Nemiroff J., Phasukkijwatana N., Sarraf D. (2016). Optical coherence tomography angiography of deep capillary ischemia. Developments in Ophthalmology. 56:139–145. Wang J., Gao X., Huang W., Wang W., Chen S., Du S. (2015). Swept-source optical coherence tomography imaging of macular retinal and choroidal structures in healthy eyes. BMC Ophthalmology. 15: p. 122. Citation: Almamoori Fawwaz and Hara Mutaz. (2019). Evaluation of Macular Circulation in Patient with Sudden Visual Loss Secondary to Behcet’s Perifoveal Vasculitis by Using (Retinal Flow) Swept-Source Optical Coherence Tomography Angiography Map. Journal of Ophthalmology and Vision Research 1(1). Copyright: © 2019 Almamoori Fawwaz. This is an open-access article distributed under the terms of the Creative Commons Attribution License, which permits unrestricted use, distribution, and reproduction in any medium, provided the original author and source are credited.